Earlier this year, the city and the Chicago Department of Aviation revealed five possible designs for O'Hare International Airport's new Global Terminal, the centerpiece of an $8.5 billion expansion of O'Hare's existing Terminal 2 that will integrate international and domestic flights. Yesterday, the city selected Studio ORD (led by Aqua Tower designer Jeanne Gang of Studio Gang) as the firm that will be responsible for designing the new terminal, which will add new gates, lounges, concessions, baggage facilities and security screening areas to a 2.2 million-square-foot space. Studio ORD's winning design features a terminal and concourses that are filled with natural light, using towering steel trusses and glass to maximize the amount of daylight that seeps into the structure. The building's Y-shaped design is meant to echo the three converging branches of the Chicago River, centered around a glass skylight (called an oculus) that is shaped like one of the six-pointed stars on Chicago's flag. 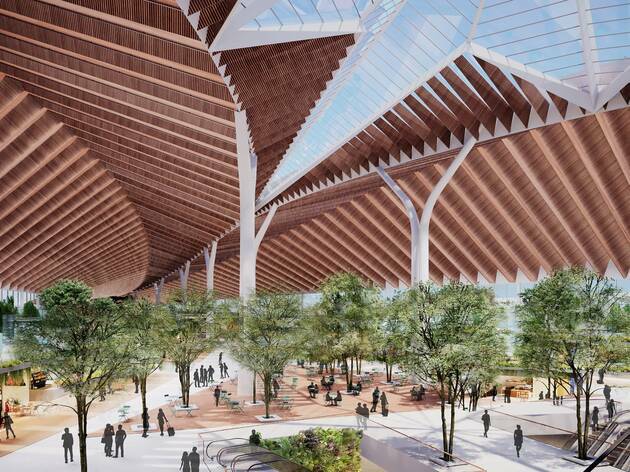 Renderings of the interior of the Global Terminal look more like a town plaza than an airport concourse, with trees and greenery sprouting from the floor amid gates and large open spaces outfitted with tables and chairs. The terminal's ticketing a security facilities are depicted as sitting above the concourse, offering sweeping views of O'Hare's airfield. 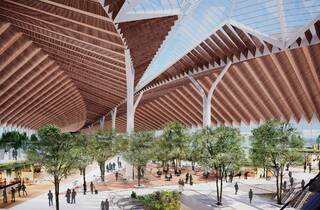 Don't expect to start taking amazing Instagram photos throughout the new Global Terminal anytime soon—the $2.2 billion project isn't scheduled to break ground until 2023 and will likely take several years to complete. In the meantime, you'll just have to stare at these renderings and imagine walking through O'Hare's latest addition.